Here’s a question many kayakers face when they’re deciding whether or not to install a fish finder on their kayaks – does everyone really need one? The first step to determine whether or not you need a fish finder is to identify whether you will be fishing in deep or shallow waters. If you are paddling through deep waters to get to a favorite fishing spot, are you still fishing over those waters, or casting to a shallower area? These are important questions to ask yourself before purchasing a fish finder, because they can be a bit pricey. If you’ve already decided that you need one, the next step is installing it – should it be mounted to your kayak permanently or temporarily? What should you use for a power supply? How do you match your power supply to your time on the water? How and where should you mount your fish finder? Keep reading for some great answers to these questions from our team of kayak experts. If you do a little research about the waters that are around you, it will help you decide whether a fish finder should be your next purchase. A fish finder helps to locate the structure that fish will typically stay around in deep water lakes, quarries and offshore. Structure is a key word for deep water fishing, so locating it is one of the secrets to bringing in a few fish, or the bigger ones in the area. How to fish that structure is another blog post entirely, as fish tend to hang out at different levels around it. If you’re crossing deep water areas to get to shallow areas, and the shallows are your primary fishing targets, then a Fish Finder may not be the solution. Fish Finders will typically not read accurately unless they are in at least eight feet of water. In most cases in that depth or less, you’re sight fishing to movement or jumping bait. Where Do You Mount Your Fish Finder? use. Several companies offer fish finder mounting systems, and doing your research will make it easier to find something that suits your own purpose. Sit in your kayak in your driveway (at the risk of looking a little silly) or the next time you’re in the water and figure out what the best position is for you. Don’t forget that you want it close enough to touch, but far enough away to give you the room to change lures, bring your fish onto your kayak and other paddling-related things. If you’re in a paddling kayak, you’ll probably want it directly in front of you, out of your paddling area. If you’re pedaling, a gunwale-mounted fish finder works just as well. Remember, however, that you’ll need to paddle occasionally, and you won’t want that big screen in your way if that’s the case. Many kayaks now have tracks, and that is rapidly becoming the preferred mounting method. Does the mount need to be swivel or stationary? In most cases, have a mount that pivots side to side is the best option, as it will allow you to get the screen out of the sun to help prevent glare and screen burn. Railblaza makes over 30 accessories that can be used for electronics mounting solutions. Another mounting issue is your transducer. Do you mount it under you kayak, on the side of your kayak or through the inside hull? Your transducer will have certain needs, and it is important to fully read the information booklet you receive with your fish finder to know for sure. Side scan transducers must have full cone visibility (the shape that transducers put out) in order to operate correctly. More and more kayakers are switching over to side-mount transducer arms, mounted on tracks. Not only is this efficient, but it also potentially allows you to move your entire system to another kayak that has tracks. With your mounting question answered, it’s now time to decide what your power source will be and where to mount it. Most fish finders draw less than .4 milliamps of power. You’ll need a 12-volt power supply, but knowing how to do a little math for electronics will go a long way. If you only have your fish finder on some of the time, and never spend more than five to six hours on the water, you can typically get away with a seven amp hour battery. If you plan on spending more time on the water and keeping your fish finder on most of the time, then considering a ten amp hour to 20 amp hour battery will be more prudent. There is also a big difference between lithium batteries and lead acid batteries – lithium will last longer, is lighter and will hold a more constant charge. You’ll want to read up on batteries before purchasing. Lithium batteries can be two to three more times expensive, but will be worth it in the long run as they tend to last four to five times longer. Installing your battery inside your kayak and running the wires through the hull is an option, but with battery packs like the new YakPack, you can run your wires on top to your power supply, as well as being able to take it out and use it elsewhere. Most of the newer fish finders offer a GPS solution. This may be the most useful aspect of your fish finder in locating spots that have fish “mojo,” and being able to come back to the same spot when conditions and seasons are similar. The most important reason you may want a fish finder with GPS is to find your way home. Your GPS will leave “bread crumbs” from where you launched to that special fishing spot and regardless of the wind, current or water conditions, it will allow you to get back to your launch site. 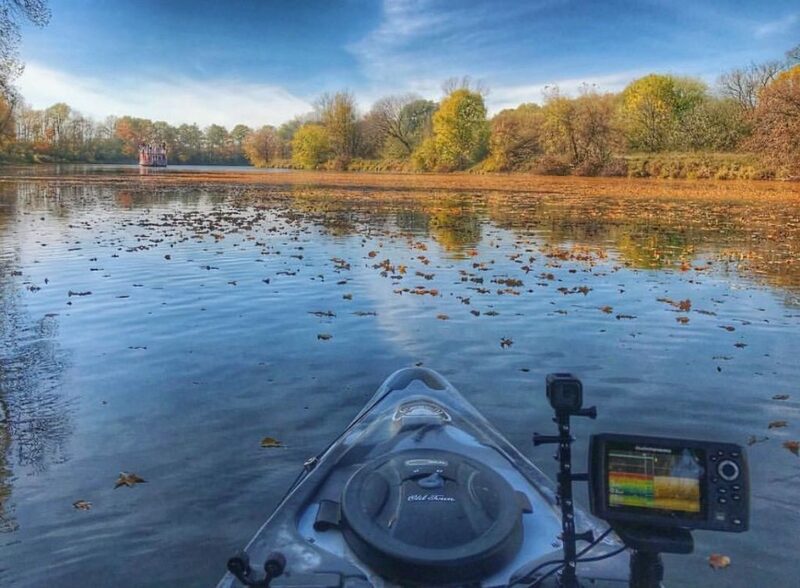 We chatted with Bill Pulkovski, an avid kayak angler in Michigan, and he has found that a fish finder is an important piece of his puzzle. The depths, the water temperature, the structure and whether it is a hard or soft bottom really help his targeting. Bass, whether large mouth or small, which are his primary targets, can be almost anywhere depending on the time of year and water temperatures. Extreme temperatures, hot or cold, will drive them deeper. Knowing the depth of the targeted species also helps to select the correct lure. The GPS function helps to show the topographical attributes of the lake in varying detail, depending on how finite the system is. Having and using a fish finder is a personal choice for your style of kayak fishing. Which fish finder to purchase is a matter of preference, as there are many options ranging from $150 to $1,000 and up that have different strengths depending on the application. The most important thing, at the end of the day, is to get out on the water – and if you can, take a friend or family member with you.